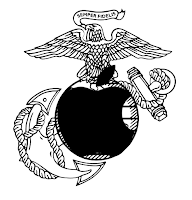 The Marines and Apple have been the biggest influences in my professional life... my way of thinking... my work philosophy. At the end of the day, they both respect and seek simplicity. Simplicity of design in products. Simplicity of design in tactics. While both organizations are well respected leaders in their fields, they go about solving problems in different ways. One's procedural and the other's artistic. One creates and the other destroys. But, there's nothing wrong with creating good and destroying bad.